Nothing evokes the joy of the holidays like sharing memories with close friends and family over a cup of great tasting coffee. That’s why Clever Girls Collective and Dunkin’ Donuts® are teaming up to give you a FREE one oz. sample of Gingerbread Cookie packaged ground coffee. This sample is good for one pot of delicious coffee to enjoy with family and friends. 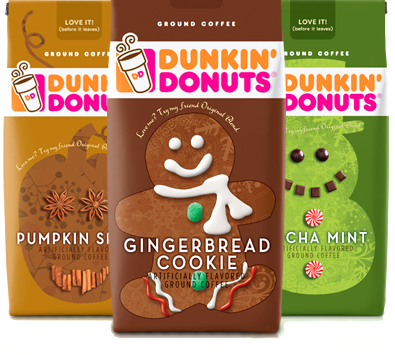 Special seasonal varieties including Mocha Mint, Pumpkin Spice and Gingerbread Cookie are only available for a limited time wherever you buy groceries. For more information, visit Dunkin’ At Home. While supplies last. Limit (1) offer per household. Offer only available to individual residents of the 50 United States and D.C..